A heartfelt novel of love and hope. “Two people, one city, different times; connected by a memoir. Can love exist in a city destined for decades of misery?” Adnan leads a weary existence as a bookshop owner in modern-day, war-torn Baghdad, where bombings, corruption and assault are everyday occurrences and the struggle to survive has suffocated the joy out of life for most. But when he begins to clean out his bookshop of forty years to leave his city in search of somewhere safer, he comes across the story of Ali, the Gardener of Baghdad, Adnan rediscovers through a memoir handwritten by the gardener decades ago that beauty, love and hope can still exist, even in the darkest corners of the world. Will Adnan find beauty, love and hope in his own life through the tale of the ‘The Gardener of Baghdad’? To find out, Ahmad Ardalan, author of this tale has kindly set aside a few minutes to chat with me today. Ahmad, I love the connection you create between two people through a memoir. What inspired you to connect two people across time in this way? Like many other Iraqis, I left the country as the drums of war were approaching before 2003. After ten years, I visited Baghdad again, a trip full of emotions to say the least inspired me to write a novel about this once great city that was facing difficult dark times. Were any of these dark times directly reflected from your own life? I believe that every writer’s fiction must come from something non-fictional, even if it was a moment in life, a situation in time. It will reflect one day in his writing. There must be a line, a chapter, a paragraph or even a name coming from something real. So, I would say yes, lines here and there from my book were influenced by real events. I love that you’ve used nuggets of real life to build upon the world in your novel. How did the characters evolve around these building events? And what have you learned from the paths of life that inspired and became this novel? And how has the passion for the culture you’ve seen cultivated, shared and seen translated into personal rewards? The love of the fans, their passionate feedback of the beauty of Baghdad, in contrast to what the media feeds them is my best reward. Have the rewards you’ve received tempted you to continue writing? The great response to “The Gardener of Baghdad” paved the way for me to write another novel (Baghdad: The Final Gathering) about that great city. What do you love most about writing that keeps drawing you back into the fray? It is part of my life. Why do you eat? Cause my fridge is full! What does the writing part of your life look like? As I write, the chapters start to form up, and the words flow. Are there any techniques that you use to ensure those words keep flowing? I never set any word limit. It all depends on the mood I am in. There are days I would write for hours, other times, I would not pen a single word. What do I do in that case? I would travel to a new place, meet new people, learn about different cultures, and the words would start to flow. What are you thinking about when your mind is in the writing flow? Reaching the heart of the readers. That is a great target to direct your words towards. Once you have a solid amount of writing done, how does editing come into play to direct the words towards your readers? I reread it twice, and make some of the changes myself, and then it is off to my editor in Ohio, who in turn does a great detailed check-up. Do you feel that your writing has progressed as you have taken the time to reread and seek external advice? I have learned a lot. It was all hard at the start, the editing, the marketing, the sales strategy. But by time, through trial and error, all that became routine, and thankfully the results were better. What are the best recommendations you have for other authors looking to make their own results better? Never give up. Follow your dreams, but if I had one advice, one platform to learn from kboards.com. This is the place where authors meet. Meet other authors and follow your dreams. I love that simple advice. And I hope your talent for recognising simplicity will carry you through to the next part of our author interview where we play in the depths of our quick-fire question round, starting with, why is lemon juice made with artificial flavour, and dishwashing liquid made with real lemons? Marketing simple as that. A brain picks up the contrast in everything! Okay, so where can you find the contrast if you’re in a vehicle going the speed of light, what happens when you turn on the headlights? Speed of light. That means I have travelled in time, who cares about the headlights! If you travelled in time, headlights just aren’t that important anymore! Why isn’t there mouse-flavoured cat food? Mouse flavor… that’s new. Let me start a billion dollar idea! I’ll let you take that idea and run with it. After chatting with writers about mouse flavoured meals, I’ve lost my taste for it! What is your zodiac sign? You gotta love the fish. If you invented a monster what would it look like and what would you call it? Large creature with a small head legs the size of a tree trunk, and I would call him Dooabule. That’s an awesome monster name. You wouldn’t want to be chased by Dooabule. And I don’t think you want to be chased by a vampire either, but sometimes I wonder what would happen if a superhero was chased by a vampire. What do you think happens if Batman gets chased and bitten by a vampire? That’s just too easy. Plus I think that there might be some better solutions out there than what DC would propose. Are you left or right-handed? Or maybe it just seems longer because you’re recovering from your scare. If you could breed two animals together to defy the laws of nature what new animal would you create? That would be awesome, and I’m fairly sure the first time that you saw a flying croc in action you’d be scared half to death! Okay, here’s another good one I like, if nothing ever sticks to TEFLON, how do they make TEFLON stick to the pan? *Laughs* Well, maybe it is Writer’s Block that gets it sticking! It would be nice to know that it’s good for something! To keep with the theme of stickiness, what is the one word that keeps sticking in your head? Before we take the interview home today, is there anything that we’ve missed talking about? It was interesting, I would like to thank you for this wonderful interview. Thank you so much for taking the time to share yourself with our readers. Home is now in sight, so can you conclude our chat by sharing your favourite line from ‘The Gardener in Bagdad’ to entice readers to pick up a copy today? And I hope it can conquer again today. Ahmad thanks for chatting with me and I wish you the best of luck with your promotion of ‘The Gardener in Bagdad’, and I look forward its upcoming sequel. Excited to read the book we discussed today? Find it here on Amazon: ‘The Gardener of Baghdad ( ASIN: B00M91LJGW )‘. 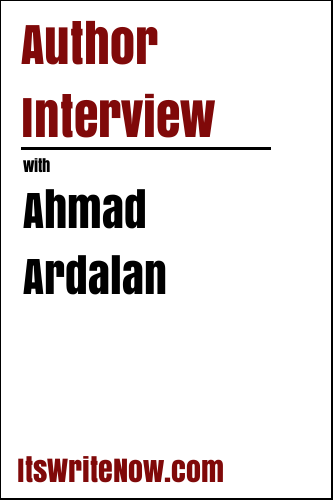 Want to find out more about Ahmad Ardalan? Connect here!